"I'm alive... I'm dead. I'm so dead!" A character is in grave peril, perhaps running away from the Monster of the Week, or just happening to be in the wrong place at the wrong time when Phlebotinum Breakdown occurred. He or she takes refuge in a vehicle or closed room of some sort and breathes a sigh of relief. And that's when the Ominous Crack occurs. This indicates that the windshield or wall is about to give, cruelly destroying the character's false sense of security. Cue suspense-filled sequence as the cracks slowly spread through the glass and/or oh-crap-I'm-screwed line. A similar fate can occur when a character is standing on ice or some other ground that cannot support the character's weight. In One Piece, Whitebeard could invoke these at will with his Quake-Quake Fruit powers. He takes it to its logical extreme: He can create visible cracks in the air, and when that happens, get ready for a building-crumbling tremor or an incoming tsunami. My Little Pony: Equestria Girls  Legend of Everfree: When Rarity is protecting the whole group from the assault of the bramble vines with her Deflector Shield, unsettling cracking sounds are first heard, and then the barrier begins to shatter like glass in spots. In The Simpsons Movie, the glass dome cracks after the explosion forcing Homer to Outrun the Crack with his motorbike. Occurs after Cale and Korso narrowly escape the Drej on a space station by ramming their ship through the dock wall into space. Korso: And you were worried. Cale: [pointing to ominous crack on the windshield] What do you mean "were"? The Novelization plays with the trope, as Cale mentally recites old spacer's wisdom regarding cracks in glass surfaces. He notes that a single crack is definitely cause for concern, but it does not necessarily mean the surface will shatter; it may still hold. A web of cracks on the other hand (like what is rapidly forming on the canopy), means decompression is very quickly going to follow. The opening title sequence of Alien³ shows Ripley and the other survivors of the second film safely in their enclosed glass hypersleep capsules. Followed by a shot of empty alien eggs. Followed by an Ominous Crack. In Anaconda 3: The Offspring, Murdoch decides to look at the male anaconda with a flashlight, even after being told it would provoke it. The anaconda proceeds to bang its tail against a portion of its reinforced glass enclosure repeatedly, causing cracks that get wider and wider with each hit. It is sedated before it can break out, but it breaks through later anyway. In The Day After Tomorrow, three men are walking from Washington, D.C., to New York during a freak snowstorm that has covered everything a meter deep in snow. They are walking across the landscape when one of them hears cracking, and realizes they've been walking across the glass roof of a shopping center. This causes a dilemma because one of them must cut his rope loose and plummet 40 feet to the ground, or all of them will die. Deep Blue Sea: Shortly after the extraction of brain tissue from one of the genetically engineered mako sharks, Dr. Whitlock is attacked by the supposedly sedated animal and has to be rushed to the surface. During the chaos that ensues, Whitlock's stretcher is dropped into the water by the crashing rescue helicopter and one of the sharks throws it against the laboratory's observation window, resulting in an Ominous Crack. Subverted in the Doom movie. Goat, the team religious fanatic, tries to bash through the glass (using his head) to get to the survivors. Not only does the glass hold, but the characters later realize that he wasn't trying to break through. He was trying to kill himself. In Force 10 from Navarone, Harrison Ford and Robert Shaw realize that they need to blow the dam they are in without enough time to escape. They set the charges for 30-seconds and slowly start walking back down the tunnel, casually thanking each other for their efforts. When they survive the explosion, they are pissed at the munitions expert from their group. As they start heading out (with some German worker coming down), they hear the stress and cracking happening around them. They rush out, yelling to the workers that they should leave as well. In I Am Legend, Dr. Neville and his two companions are trapped in his glass-encased lab in his basement while a horde of ghouls are attacking. The lead ghoul keeps pounding away at the glass (with his face) to get to him. In the 2008 film adaption of Journey to the Center of the Earth, the heroes are collecting diamonds from inside a volcanic vent but soon learn they are standing on thin volcanic glass  followed by several cracks. This concludes with one of the heroes dropping a diamond into the glass, ultimately resulting in it shattering and the heroes falling down a tunnel towards the Earth's center. The movie Jumanji has the heroes take refuge from a mosquito (it has a four-inch-long needle, is the size of a pigeon, and is carrying a deadly and unknown disease) in a car. It starts tapping on the windshield with no effect prompting one of the protagonist to say, "See, he can't break through the glass." This is followed by a large crack as the mosquito tries again. One scene in The Lost World: Jurassic Park has a woman lying on the windshield of a dangling vehicle as cracks slowly spread through it, and another character tries to get to her before she falls through and down a cliff. Marvel Cinematic Universe: In each of Iron Man's appearances in his movies and the Avengers movies (The Avengers, Avengers: Age of Ultron), critical damage to the suit is almost ubiquitous with his viewscreen cracking. Whether or not it's the actual eye-hole coverings in the helmet or just part of the suit's fancy GUI is never made clear. In the remake of The Omen (2006), a huge silverback gorilla reacts violently to young Damien's presence, slamming into the glass of its zoo enclosure and leaving increasingly-large cracks with each impact. It doesn't (quite) break through. In Poseidon, creeping cracks in the glass and small leaks around the edges precede the total collapse of the ballroom's windows and the drowning of everyone who opted to stay behind. Star Trek Into Darkness has one when Khan and Kirk take spacesuits to sneak aboard the Vengeance through an Asteroid Thicket, a tiny pebble fractures Kirk's HUD, forcing him to navigate the field unassisted and finding a tiny airlock from miles away. In the two part episode of CSI "Grave Danger" Nick Stokes is buried in a glass coffin. He is forced to shoot out a light in there (as the villain wired it to a light controlled by the rest of the team via a webcam, and when it's on it disables the air pump). This causes cracks to develop and fire ants to come crawling in. Subverted in that, although the Ominous Crack preceded the invasion of nasty, nasty fire ants, their presence alerted Gil to a vital clue that led him straight to Nick's location. A meta-example comes from "Battlefield", when Ace finds herself trapped in a water tank. At first, Sophie Aldred was just acting, but then she felt the glass in front of her bulge and crack note I can only guess that she was in a double-walled tank, which would allow her to stay dry while the second layer filled with water. Fortunately, her costar Sylvester McCoy also noticed, and called for her to be pulled out. "The End of the World": The windows of the observation deck and the main reception room begin to crack as Platform One's heat shields fail and the Sun's expansion is imminent. Different sort of crack, but Series 5's "cracks in time" are definitely a bad sign when they start turning up. They can consume people and things, and when they do, those things cease to have ever existed. In "The Wedding of River Song", cracks start appearing in the Silence's containment tanks when it becomes clear that they aren't safely captured. In the Firefly episode "Our Mrs. Reynolds", a couple of villains get to experience this when Jayne puts a couple of high-caliber rounds into their window. The window between them and hard vacuum, that is. The submarine scene in Stargate SG-1 episode "Watergate". The glass does break as the pression rise, but the cabin doesn't flood since it is in fact made of intelligent aliens with a watery form. 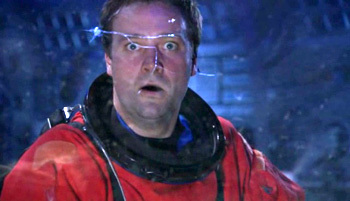 Stargate Atlantis has done this twice to the same character, probably because his Oh, Crap! expression is so funny. In "Grace Under Pressure", Rodney and Lieutenant Red Shirt crash a puddle-jumper into the ocean on a test flight. They look out at the water in wonder and then — surprise! — Ominous Crack. Redshirt manages to push Rodney into the other section of the jumper before the cabin floods. UFO: In one episode an alien sniper fires a bullet at Moonbase; it hits a window but instead of shattering it merely cracks it. Eventually, the internal air pressure inside the room causes the window to disintegrate, killing the astronauts inside via explosive decompression. In Age of Mythology, two missions involve Gargarensis attempting to break through one of the Hades Gates with an enormous Battering Ram. At first, the gate seems as indestructible as ever, but once it takes 40% damage you see a large, disturbing dent mark where the ram hits it. Gargarensis even Lampshades it. In Elite: Dangerous, damage to the starship's canopy will cause it to begin to crack at the edges. Further damage causes them to propagate until a complete failure at 0%, where the canopy dramatically cracks, shatters, and blows out into space, taking most of your Diegetic Interface with it. You are then in a race against time to reach the nearest Space Station before your spacesuit's Oxygen Meter runs out. Super Mario Sunshine has one in an early level, when Mario jumps onto the top of a windmill where Petey Piranha is. The roof begins to crack, causing Mario and Petey to have a synchronized Oh, Crap! moment. Lampshaded on Futurama: in the episode "The Deep South", as the Planet Express ship sinks to the bottom of the Atlantic Ocean, an Ominous Crack is heard, sparking the following line from a distraught Bender: "What's that? Is someone bending girders...?"